It was a shame that the Woodstock Film Festival scheduled the World Premiere screening of Chasin’ Gus’ Ghost for last Saturday night, at the exact same time as the headlining, festival-sponsored gig by the Felice Brothers, because the movie and the band are very much part of a pair. Chasin’ Gus’ Ghost, a documentary, traces Jug Band music back and forth through the ages and all across America. The Felice Brothers are the Catskills’ are the future of that same contagion – a good time, old timey anything-goes party music that’s an intrinsic part of the American folk fabric. The band and the movie would have made worthy bedfellows, had someone thought to promote them together. In Chasin’ Gus’ Ghost, director Todd Kwait attempts to offer a history of jug band music, a process that takes him from New York to Boston, Memphis to Louisville, and all the way to Sweden and Japan, too. Along the way, he almost forgets to explain for us what actually comprises a jug band, a question I’ve been pondering for myself of late, having been reading about the jug band revival that accompanied the whole folk/roots heyday of early 1960s Greenwich Village. John Sebastian, who lived in the Village back then, was in a group called the Even Dozen Jug Band prior to forming the Lovin’ Spoonful, and to this day performs with his J Band. One of his peers claims, early in the movie, that the Spoonful, who had seven top ten hits between 65-66, were themselves an “electric” jug band, but as I learn through Kwait’s own quest, they were not: they didn’t use a jug. It’s true: the “jug” in jug band is not a metaphor or euphemism. Jug band music is so-called for the simple reason that it’s played by a band using jugs, the kind of clay or tin vessel you’d drink out of in the very old days, and likely therefore carry around with you – in the cotton field, on your walks, on the horse-and-cart if you were so lucky to have the transportation. By all accounts, it’s a lot harder to get notes out of the thing than you’d first think – and even when you do, there’s a danger of it sounding like a kazoo. But the jug is only a part of it: most jug bands through the ages have also used banjos, guitars, fiddles, accordions, washboards and string basses, anything available to get a down-home hoe-down sound that, at its best, combines country, blues, ragtime and jazz to form the most honest Americana you could imagine. Kwait traces the jug band’s real roots back to Louisville, home of the Kentucky Derby – with the point rightly made that American music once traveled by river, not by road. But his search is for Gus Cannon of the movie’s title. Born in the 1880s in Mississippi, Cannon made his name on Beale Street in Memphis and was a bonafide race music star until the bottom fell out of the market in the great depression. He went over thirty years without making another record – and then the Rooftop Singers had a number one hit in 1963 with his “Walk Right In” and Stax, of all labels, signed him up for an album despite the fact that, aged around 80, he barely had a voice. Cannon lived on to the ripe old age of 96, but despite getting royalties from “Walk Right In,” he appears to have died an embittered and impoverished old man, with barely a gravestone to his name. When this ignoble farewell was brought to the jug band revivalists, they arranged an appropriate memorial at his cemetery and paid for a decent gravestone. These revivalists, white men almost to the last are the American equivalent of the British rockers who so keenly studied the blues: their love of old, black, traditional American music runs deep and true, even as they recognize that they never shared its enslaved roots. Indeed, part of the film’s premise is that few people ever knew much about the old artists they were listening to – and for all manner of good reasons, given that record companies often assembled and disassembled groups purely for the process of feeding the race record market. Tracing something as amorphous as jug band music is an endless task, and to his credit, Kwait recognizes as much. Chasin’ Gus’ Ghost is as much about the movie-maker’s own journey as the story of a forgotten American music. Given that it’s such a niche movie, it should come as no surprise that he acquired the on-screen co-operation of almost every living jug band musician, biographer or archivist – including the Grateful Dead’s Bob Weir, the Rooftop Singers’ Erik Darling, Jim Kweskin, Taj Mahal, Geoff Muldaur, Maria d’Amato and, of course, John Sebastian. Kwait, a fan who financed the move himself from his profitable business, professes astonishment that someone as successful as Sebastian would offer his services, but as he quickly discovers, a nicer man to have survived the sixties would be harder to find. Indeed, most of the musicians appear profoundly grateful for the opportunity to share the music and its history. As a result, anything that Chasin’ Gus’ Ghost loses in professionalism or marketability, it more than compensates for in warmth and education. The movie will not likely find general release, but it ought to become essential material for any musical library of repute. At one point in the movie, D’Amato and her husband Muldaur are shown onstage with the Jim Kweskin Jug Band singing the old Carter Family standard, “I Never Will Marry.” Half an hour after seeing this clip, Posie and I were at the Colony Café over in Woodstock watching the Felice Brothers interject the very same line into the final numbers of their joyfully disheveled Saturday night set. That kind of myth-making hyperbole could only come from the UK, and sure enough, the Felice Brothers currently have themselves a deal with British label Loose – for whom they recently released the Live at the Arizona album. American audience are making do with the equally excellent, home-pressed Adventures of the Felice Brothers Vol. 1. 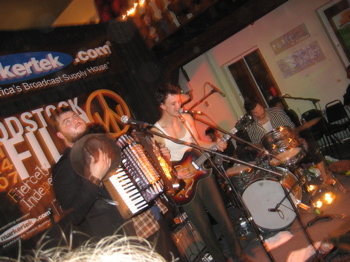 The Felice Brothers – I’m not entirely sure which one is which – in their element, the Colony Cafe, Woodstock, Oct 13. Though it’s enough to make a new fan confused, it hearkens back to the old days, when groups recorded for whatever label financed the next session, often delivering the same songs for different companies many times over. And that’s not the only thing about the Felice Brothers that conjures up nostalgia: they wear the kind of old workmens’ clothes that went out of fashion fifty years ago, with front-man Ian sporting a harmonica round his neck as well, just like Dylan of yore. Switch that harmonica out for a jug – as per Gus Cannon – and the group are but a younger, whiter version of the ancient heroes of Chasin’ Gus’ Ghost. Because of the time clash, we got to see but the last few songs of the Felice Brothers set, by which point the show had either ascended or descended, depending on your fancy, into the kind of semi-drunken chaos that made them more redolent of prime era Pogues than Woodstock predecessors the Band. The comparison to Shane MacGowan’s old group is relevant not just because of the constant references to alcohol (e.g. “Whiskey In My Whiskey” and “Where’d You Get The Liquor”) but because the Felice Brothers are story-tellers every bit as much as they’re musicians: their American release comes with song titles about “Ruby Mae” and “Helen Fry” and we walked in one that appeared to be about “Marion Baum.” In this regard, at least on record, they also sit comfortably alongside the likes of Nick Cave, and so it should be stressed that, while it’s perfectly appropriate to play up their Americana, their folklore is also global. The Felice Brothers play often round these parts but their impending opening tour slot with Bright Eyes and growing media glow suggests that we were wise to capture them in a small venue while we still could. The atmosphere inside the sold-out Colony Café was certainly several degrees warmer than usual, with old folks dancing alongside a core young audience that was sporting a thrift store dandy look, replete with waistcoats and fedoras. The Felice Brothers appeared to know everyone in the front rows by first name and, after an initial encore of their singalong “T For Texas,” invited a couple of these friends up to join them for a shambolic instrument-swapping finale of the old gospel-spiritual traditional, “Glory Glory.” It may not have had the spit and polish of the old jug bands’ renditions, but it certainly had the spirit. The circle, clearly, will not be broken.